Here is just something simple to start off with, a blast from the past. 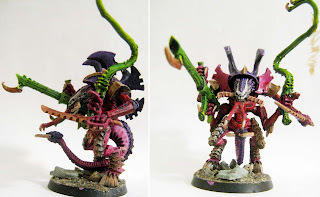 A re-shoot of the classic Hive Tyrant model, this time with a few photo editing lessons under my belt the levels should be just right on this one. I apologize for the burriness in the top right hand side of the image, I've made sure to turn off the time and date settings on the camera so that i no longer need to do messy edits as seen here. It's going to take awhile to get used to using this camera, i just recently found it floating around in my possession, but at 5 mega pixels, it's a little on the lacking side. Maybe i'll have to see if i can snag a digital slr somewhere. I will more than likely be posting a second post today a little later in the day when i finish a little more of the unit that the model from above belongs to.